Canada subprime is much worse than everyone thinks, this is not going to end well. US auto production has collapsed. The push to take down the economy continues with tariffs on China and China penalizing the US. The party is over QE is coming to an end, the Fed is raising rates and unwinding the economy will not be able to survive this and the central bank knows this, this is how they are trying to control the narrative. George Soros buys stock in the NY Times and other publications, looks like he wants to control the propaganda. US resumes funding the White Helmets, the question is why now. Russia is reporting that the deep state is preparing another false flag in Syria, is this a coincidence or planned. The IG report has been released, this report is the modified heavily redacted report. Q has told us the people must demand the unredacted reports a petition has been started and it is located here. I realized that people aren’t lying when they say Canadian real estate is nothing like the US in 2006. Canadians just don’t understand what happened during the US subprime crisis. They also don’t really understand subprime lending is alive and well in Canada, we just use different names. There’s subprime borrowers and subprime loans. Subprime loans are any loans that are below prime, as in the typical lending criteria isn’t met. The part that’s poorly understood is a borrower, a loan, or any combination of those can be subprime. A borrower with excellent credit, might want a subprime loan. This happens more often than you think, and is usually because a bank won’t lend as much money as needed. No one thinks of a family in a nice neighborhood with a private loan to buy their fourth or fifth condo as subprime, but they are. Most people knew subprime lenders blew up, and naturally blamed poor people and immigrants with low credit scores, as is the way. However, new research shows that the sudden rise in foreclosures during this period were due almost exclusively to investors with good credit. Good credit, but using subprime lenders. Canadian subprime lending is often done through private lenders, you access through a mortgage broker. Good brokers always start at the best lender, that usually has lower rates than your bank. When you don’t qualify for these, they move up the chain. If your credit profile won’t even work at “bad credit” lenders like HomeTrust, they’ll suggest a private lenders. Bad credit, no credit, no problem. There’s usually a private lender that’s willing to make a deal. Sounds great, so why doesn’t everyone use private lenders? They aren’t taking bank rejects as a charitable cause, they’re doing so because they can charge a risk premium. Despite being off of record low interest rates, these lenders charge upwards of 8% and we’ve seen mortgages well into the 20s. The broker also gets 1%-3% of the loan, so there’s little reservation suggesting them. If you can do math, you’re probably wondering how people make money on these deals? Transunion estimates that 11.9% of the 28.4 million Canadian consumers with credit profiles are subprime. That’s roughly 3.4 million Canadians, but we can’t be sure these are the borrowers. What we do know is private lenders became extremely popular in Ontario recently. US Manufacturing production slumped 0.7% MoM in May – the biggest drop since July 2016, dragging the headline Industrial Production print down 0.1% MoM. Update: Beijing responded that it would retaliate with tariffs in equal scale to the $50BN of duties on Chinese goods unveiled by the Trump administration. “China will immediately introduce countermeasures of the same scale and strength,” an unnamed Chinese commerce ministry spokesperson announced on the ministry’s website. CHINA TO IMMEDIATELY TAKE MEASURES OF SAME SCALE AGAINST U.S.
... is about to go negative some time in the third quarter of 2018. However, when looked at from a different, more short-term perspective, the central bank party is already over. There are two direct consequences of this reversal in liquidity: rising market fragility and economic contraction. markets become more susceptible to event risks. Billionaire globalist and political meddler George Soros has purchased $3 million worth of shares in the New York Times. Soros has been accused of attempting to meddle in the internal affairs, including elections and other democratic processes, of sovereign nations to suit his own political agenda. Through his investment firm, Soros Fund Management LLC, the globalist kingpin purchased 126,400 shares in the New York Times Company . According to a filing to the US Securities and Exchange Commission (SEC) in May, the shares are worth $3,046,000. Trump has authorized new funding for the White Helmets which had previously been put on hold. A State Department press release puts the initial funding figure at $6.6 million to continue what it calls “the vital, life-saving operations of the Syrian Civil Defense, more commonly known as the White Helmets.” Elsewhere on the State Department’s website the group is referenced as “first responders” in Syria; however, it remains an indisputable fact that the group only operates in al-Qaeda and anti-Assad insurgent held territory. In early May the Trump State Department froze funding to the controversial aid group which had provided the sole evidence that Syrian President Bashar al-Assad reportedly used chemical weapons on his own people in an April 7 attack on the city of Douma. now we know there are multiple videos proving the White Helmets operate closely alongside know al-Qaeda terrorist groups, and have even participated in al-Qaeda execution videos typically in a support role of disposing the bodies. The White Helmets are a 3,000 member NGO formally known as the Syrian Civil Defense. Established in “late 2012 – early 2013” after a group of 20 Syrians were trained and organized by former British army officer James Le Mesurier. The group then received funding from Le Mesurier’s Netherlands-based non-profit group, Mayday Rescue – which is in turn funded by grants from the Dutch, British, Danish and German governments. The US has in the past provided at least $32 million to the group – around 1/3 of their total funding – through a USAID scheme orchestrated by the Obama State Department and funneled to the White Helmets using a Washington D.C. contractor participating in USAID’s Syria regional program, Chemonics. Now the Russian Defense Ministry Spokesman Igor Konashenkov warned early this week that US-backed Free Syrian Army (FSA) forces are planning a “serious provocation” aimed at justifying a new round of Western coalition missile attacks against Syrian government bases and facilities. Russia says it is aware of the existence of a video which will be used to “prove” an Assad chemical attack, similar to the videos which have emerged in past events. She added that the report is questionable as it was issued more than a year after the reported incident. On June 13 the fact-finding mission of the OPCW confirmed the use of sarin and chlorine in the Syrian province of Hama in March 2017, not saying who is to blame for the attack. According to the Kremlin, the two leaders expressed their readiness to coordinate inside Syria and expand their relations in the region. 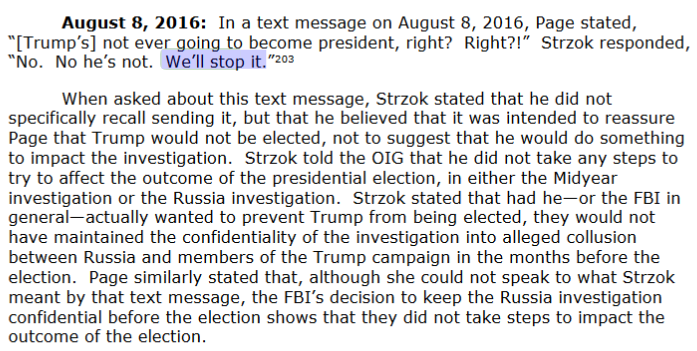 Strzok’s stated ambition was to stop the Trump presidency. 1. Those of you thinking that this public, written IG Report raises more questions than it answers, are EXACTLY on the money.That’s the entire point of it. 2. The key word here is the word ‘public’. That’s because this ISN’T the complete, unredacted report. This investigation & report occurs during multiple, ongoing DOJ investigations and GJ/ criminal hearings. Not to mention a highly polarized & politicized environment. 3. this ‘public’ report likely excludes evidence, that’s currently needed by DOJ in criminal cases.It only includes what has been permitted to be made public.POTUS, as well as other select individuals, have the OTHER, unredacted, unclassified report. 4. I also used the word ‘written’. That’s because the OIG Report has a written component (today’s report) and an oral component (Horowitz testimony on 18th). this most likely isn’t the end of the report and much will be clarified on the 18th. 5. Another thing. Unlike most IG Reports, this isn’t a stand alone, isolated report. Apart from criminal investigations ongoing, this is the 2nd of 3/4 OIG Reports to land, emanating from the original scope of Jan 12, 2017. 6. Keep in mind something else. The report has been designed to protect those who have flipped. The same people appear in each report, in relation to different events. An example – Priestap seems almost marginal to events, when we know in fact that he was probably central. 7. Also, stay focussed on the SCOPE of this report.The report is NOT about whether Clinton broke the law with her server (she did), but about the FBI exoneration of her.The two are different. Although it was nice to see Crooked get a mention (tweet 10, below). 8. Last, note the FUNCTION of the OIG. Most have seen the exec summary & recommendations, differ from the body. Liberals, being ignorant, see the recommendations as the end of the matter.They don’t understand what the OIG does, let alone the context, explained above. 9. Put simply, OIG does investigation, DOJ does criminal probes & law enforcement. The OIG could say that Comey was a martian, who should be criminally referred for jaywalking. Or it can make zero criminal referrals. It matters little. 11. #1 – FBI Director Comey was insubordinate & incompetent. That’s huge. Why?Trump’s decision to fire him is now fully vindicated. Any potential ‘muh obstruction of justice charge’ is now null & void. 12. Also, Comey’s credibility as a witness has been shredded. A prosecutor could try and use him, of course. But a good defense attorney would tear him apart.Remember, there’s a mountain of incriminating evidence against him, outside this report. 14. #3 – Peter Strzok & Lisa Page show clear bias and intent to ‘get Trump’ BEFORE he was elected. OIG: (pp 420/1): ‘not only indicative of a biased state of mind but, even more seriously, implies a willingness to/..
15. /…take official action to impact the presidential candidate’s electoral prospects’That’s a mind-boggling finding, right there. They weren’t acting alone, either. 16. #4 – Page & Strzok appear to have deliberately by-passed official channels in their effort to exonerate Clinton, (working with DOJ attorneys and McCabe/Kadzic). 17. #5 – Also, 13 anonymous Obama officials were communicating via private email (footnote, p89).NOTE: Obama (POTUS) & Clinton (a private citizen, when candidate) appear to have been emailing with each other, DURING THE ELECTION. 18. Oh, just another small thing.#6 – Foreign actors appear to have compromized Clinton’s email account. IMO they could have just put that in and it would have been a bombshell, in itself. 19. #7 – The FBI was leaking like a sieve to reporters. The annexed tables show a disturbing network of corruption between FBI agents and reporters. This will require further investigation and is a likely h/t to the many ongoing leak investigations. 20. #8 – Senior FBI officials who were recused from/ not involved in MYE (eg McCabe/Kadzic) were trying to influence/involve themselves into the investigation.That would be ‘Andy’ McCabe, currently under criminal referral. 21. #9- The FBI appears to have been concealing incriminating texts (and other evidence about MYE) from Congress, then lying about why they did so. 22. AND #10 – Comey & Co sat on the evidence in the Weiner laptop, for as long as they could, knowing the connection between Abedin and HRC. Until they said it was a nothingburger, just days before the election. A decision that remains unexplained. 23. There are MANY other damaging facts in the report. I chose just 10. But back to context. The OIG doesn’t have the same power as a Special Counsel, or AAG like Huber. It also admits (page 5) that it was unable to consider the full span of events exhaustively. 24. And that’s the point. This report is NOT designed to nail people to the wall.The objective is to raise questions and to PROMPT further investigation.Just the ten facts I raised are damning. They DEMAND FURTHER INVESTIGATION. 25. Which I predict will now happen. By the the DOJ, or a body set up under DOJ oversight. With criminal jurisdiction & law enforcement powers. NOTE:Starting to see what comes next? It’s a process, folks, part of a bigger picture. 26. People who want Horowitz to be like some ‘fire and brimstone’ preacher, delivering justice, are missing the point.He doesn’t have the power. Nor is it his style.But it’s also GOOD that he’s fact-finding and ‘dull’. Why? 27. Horowitz has OTHER reports coming. Arguably FAR more explosive than this one, as well. He needs to maintain total impartiality and independence. America’s deranged TDS libs will demand his removal at the drop of a hat, if they sniff any supposed partisanship. 28. Last thing – notice that amid all the noise, one person has been TOTALLY silent?POTUS Donald J Trump. 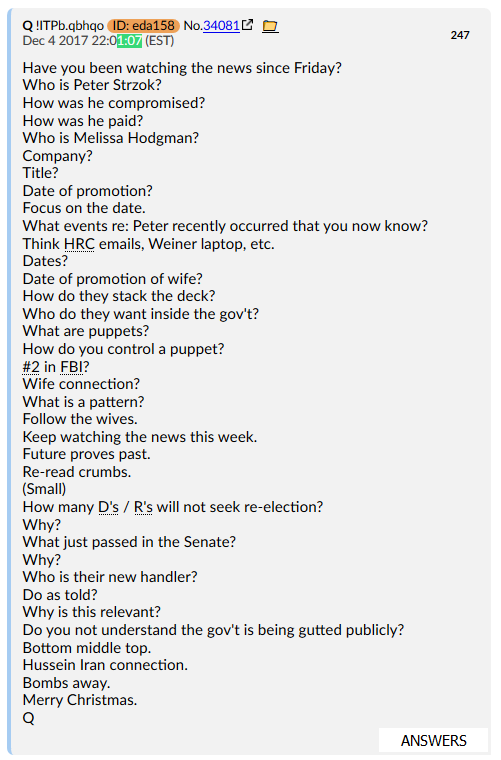 Somthing interesting with Q posts 105, 106, and 107 were missing from /patriotsfight/? 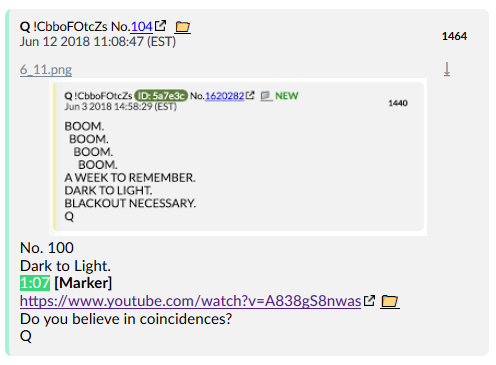 We’re going to focus on post 107 here because, well, 1:07 has already been listed as a Marker by Q himself. He first established “Dark to Light” as a future-proves-past proof, and then used the opportunity to use the timecode from the video Trump shows Kim Jong-Un as a specific marker. Why did Q pick this as a marker? In other words, 107 = 10 + 7 = 17 = Q. Pretty cool, pretty cool. I like it. That seems… awfully relevant to the IG report, doesn’t it? You can go to Qanon.pub and hit that little “answers” button you see in the bottom of the post, if you need to catch up. Strzok’s wife was Melissa Hodgman. So the question is… Was Strozk’s wife Hodgman directed by Obama to let these Iranians off the hook for the explicit purpose of helping them manufacture ballistic weapons in Iran? 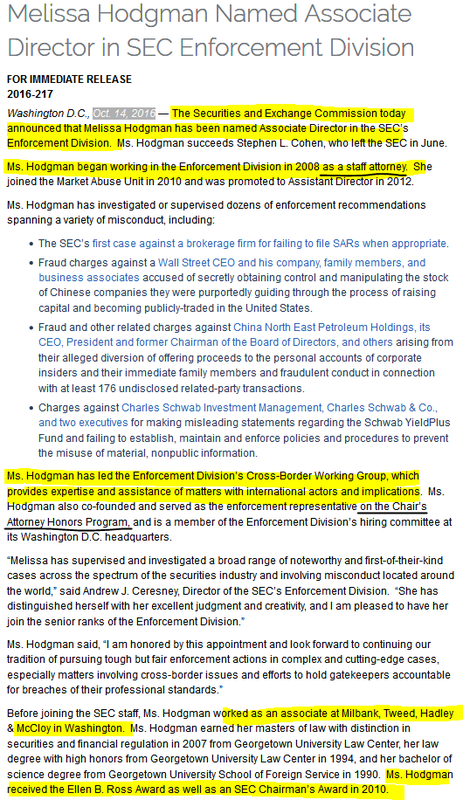 She worked at the SEC since 08, after all, and specialized in the “assistance of matters with international actors and implications.” Was part of Strozk’s motivation in all this literal self-defense (even as he was cheating on his wife with Page)? Is this the actual angle they’re going for, here? 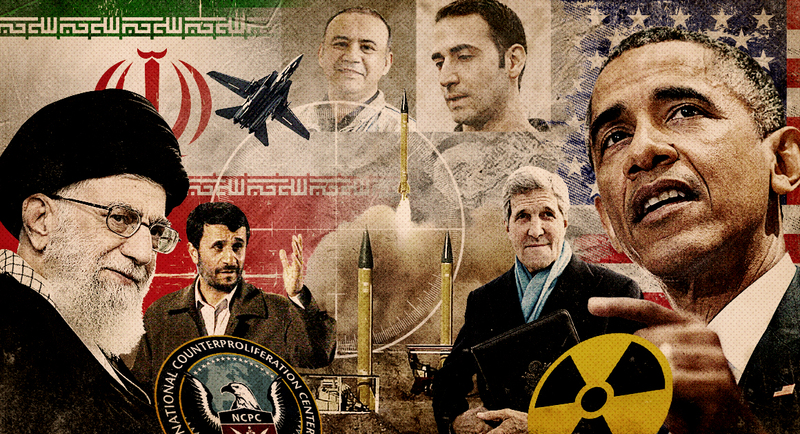 Link Obama to terrorists who were tasked with helping Iran manufacture ballistic weapons? Again, don’t get me wrong; we know he’s guilty of a LOT more than that, but I have to sit back and wonder if this will be the actual angle of attack white hats choose to lead with. On Page Xii of the IG report the Department of Justice Office of Inspector General (DOJ-OIG) highlights numerous FBI officials who accepted bribes from multiple media outlets including: “tickets to sporting events”, “golf outings”, “drinks and meals” as well as exclusive invitations and admission to “nonpublic social events”. The OIG investigative finding was disturbing enough to launch a separate set of investigations that will be included in follow-up reports. Unredacted declassification of the Department of Justice Inspector General report for public viewing.